By August 2, 2017, we will have used more from nature than our planet can renew in the whole year. We use more ecological resources and services than nature can regenerate through overfishing, overharvesting forests, and emitting more carbon dioxide into the atmosphere than forests can sequester. We say “stop!” Stop to Earth Overshoot Day creeping up the calendar year after year, as our global Ecological Footprint expands further beyond what the planet can renew. Over a year ago 190 countries committed to maintaining global warming below the 2 degree Celsius threshold. Imperfect as it may be, the Paris Climate Accord generated global goodwill and hope that humanity was ready at last to tackle its biggest challenge yet. On June 1st the Trump Administration reneged on America’s promise. MIO-ECSDE’s member Global Footprint Network, together with many governments, businesses, NGOs, and individuals, in contrast are doubling up their commitment. Because it is necessary, possible and desirable to #movethedate. Gaining 5 days every year is all it takes to bring humanity’s Ecological Footprint back to one planet before 2050. And solutions abound. 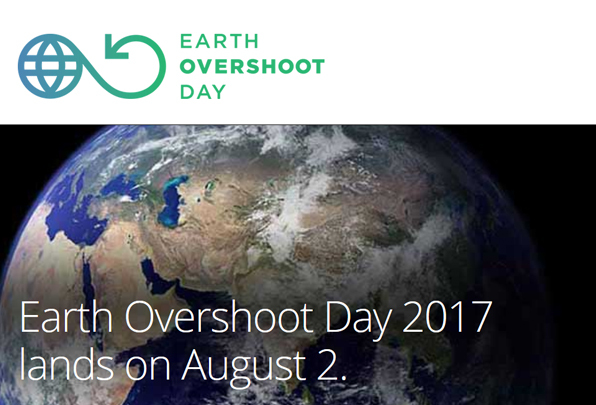 How will YOU #movethedate of Earth Overshoot Day? Choose one or more of pledges here to #movethedate and create a sustainable future!